provides sharp resolution at long distances for more accurate shooting for wide open areas. help determine holdover for distance and cascading dots/lines compensate for wind. of just 5.4 inches for mounting on short actions, muzzleloaders or lightweight mountain rifles. milled from solid aluminum stock so there are no welds or seams, for greater strength and durability. GS3 3-15x56 is rated 4.0 out of 5 by 6. 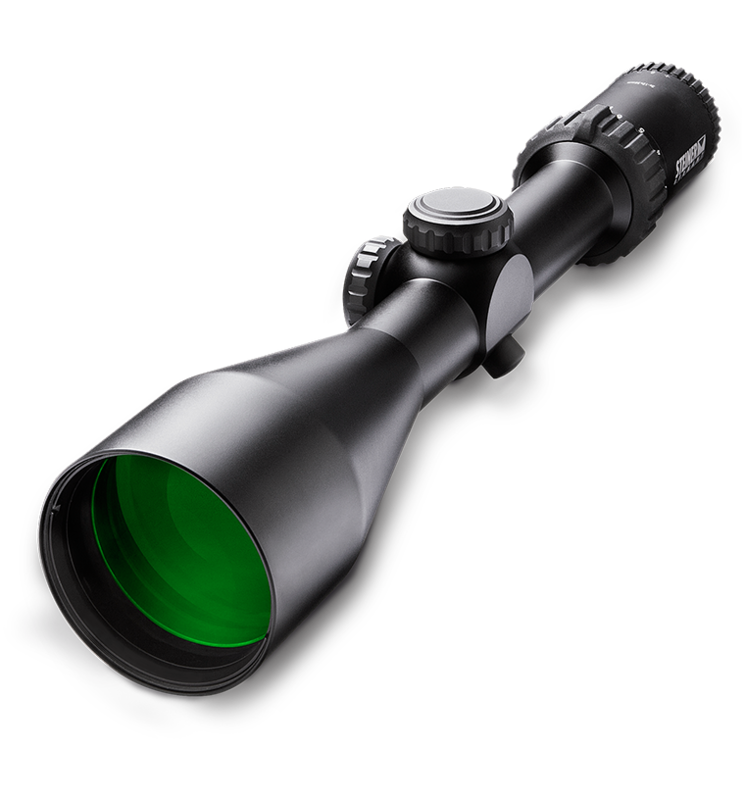 Rated 5 out of 5 by csoko from after two hunts can tell its great low light scope I have had Steiner nighthunter binoculars for years.. Scopes Ive owned never performed like my binoculars till now...If you like to hunt early and stay late, this scope IS the one. Rated 5 out of 5 by Cody from Good quality well-built I recently purchased this scope for my 280 Ackley improved. So far it has been a great scope clarity by far some of the best I've used. It fits great fit and feel is great. The scope Does have some weight to it but my rifle is very light. so they work together very well and does not bother me. The scope is great,overall well-built and would recommend this to others. Rated 4 out of 5 by THE LEGEND from MORE THAN I EXPECTED Being in the sporting goods industry, I get to use a lot of different optics, as well as other items. Here in the deep south, the last 15 minutes of the day, can be the difference in taking home a big buck, or just the nightmares of what could have been. I have been using the GS3 3-15x56 this season, and I have been pretty impressed. I love the wide field of view offered by the 56mm, and the 15x where most are 12x is really helpful in identifying shooter or non shooter. the clarity is very impressive, and the light quality in low light conditions, was more than I expected, especially for a scope in this price range. the click adjustments are precise making the scope very easy to sight in. If you are in the market for a high quality scope at an affordable price, the GS3 is the scope for you. I am impressed to say the least, and with all the years I have been selling and using this stuff it takes a lot to impress me, the GS3 3-12x15 impresses me, it impresses me a lot. Rated 1 out of 5 by AVM Mike from Unable to focus reticle and target I bought this after a Tx5 5x25 that is spectacular. This scope is not. The clarity is wonderful, and as far as I know, it would hold up under hunting conditions. Unfortunately, I'll never know. I cannot get a clear reticle and while maintaining target focus. At 100 yards, if I have a crisp reticle, the target is out of focus. I can get close at 10X but the target will not be in focus. At 15X it's unusable. If I drive the reticle out of focus, I can get a clear target but that is quite pointless as I have a very fuzzy reticle. I've returned twice and I get the same story, that they were unable to reproduce the issue. Of course, when returned to me, I can instantly duplicate the problems as it remains. I asked them to swap out the scope and they refused. So now I have a worthless, fairly expensive scope. Steiner customer support it terrible and I'll now stick to Zeiss and Leica. Don't waste your money. Rated 4 out of 5 by Mako from Very clear. Seems very rugged. Love the scope. Gathers light very well. The only negative I can say is a scope that cost this much should come with some sort of dust cover. No porblems with the scope itself. Rated 5 out of 5 by Tazcop65 from Awesome hunting scope! I bought this a week ago, optics are very sharp and clear. Scope was a breeze to boresight and sight in on bench. Where is the scope assembled what country ?and where is it made? Made (and assembled) in the USA here in Colorado. I have a Predator Xtreme 3x12x56 and would like to reset the elevation turret to zero but the web dose not expand in clarity how to do it. Is the screwdriver required a very small one as a jewelry one and is it a very small screw that must be backed off ? The indicator (portion with white lines and numbers) on the turret has a relief cut for a small tool to be inserted. Insert the tool into the slot and catch the edge of the slot. Press firmly ontop of the dial to prevent the turret from clicking while rotating the dial indicator. You can now rotate the indicator left or right to align the zero. I just bought a gs3 3x-15x56 scope and I am looking for covers, do you make or can you suggest any? I would recommend Butler Creek. They have a sizing chart and make a great product! Only the T5Xi 3-15x and 5-25x come with sunshades. Sunshades are available for the M5Xi, but must be purchased separately. Hello, Tactical turrets are not available for the GS3 series. &nbsp;what yardages,&nbsp;with what&nbsp;balistic coefficient&nbsp;and velocity are the mill dots set up for on this scope ? And are they changeable for use with custom hi velocity&nbsp;loads ? Can this scope hold up to .50 bmg? The GS3 is not illuminated.